The Selkirk Twin Wall chimney system is designed for use with oil, gas and solid fuel when used with the appropriate fire stopping components. The system is designed for gravity flow application. The Selkirk Twin Wall chimney system is available in a range of diameters. Chimney Flue Liners type L (in grade 316) and type LHR (in grade 904) is a double skin, smooth bore stainless steel flexible multi-fuel liner. 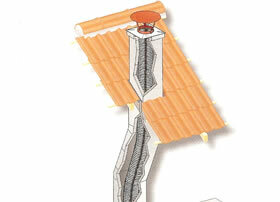 This range is perfect for renovation of existing masonry chimney. We also supply Poujoulat flues & liners.